Houston, TX - Curtis Steel, a flat rolled steel distributor and coil processor, has installed a precision high speed single loop coil slitting and automatic slit coil packaging system at its Houston, TX, facility. The slitting and packaging system was designed and built by Braner/Loopco, Schiller Park, IL. The new Curtis Steel slitting and packaging system is capable of processing high strength cold rolled, hot dipped and electro galvanized steel, and aluminum alloy coils in gauges from .010" through 3/16". 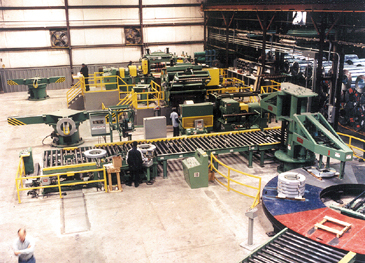 The slitting line processes coils weighing up to 50,000# in widths to 60", with coil diameters up to 72". Slitting capacity is 31 cuts in .010" at 1,000 FPM, and 7 cuts in 3/16" at 300 FPM. The automatic slit coil packaging line handles slit coils weighing up to 10,000#, in widths from 1" to 24". The slitting line is a high pass line "Generation V" coil slitting system designed for fast coil threading and quick job changeovers. The high pass line design takes full advantage of the natural coil set for extremely fast coil threading, and eliminates coil breaks induced by reverse bending the strip as is common on low pass line slitters. Four master coils are staged ahead of the slitting line on a Storage Turnstile and coils are quickly loaded onto the Uncoiler by Coil Car. A heavy Telescoping Blade Peeler and Pinch Rolls feed the strip through the pushbutton-positioned side guides, into the Entry Shear. A new "state-of-the-art" fiber optic infrared Edge Guide senses the strip edge and automatically positions the Uncoiler to align the coil with the side guides. A Shear squares the leading edge, and the cropped ends are collected in a Scrap Cart for easy disposal. The Slitter is a precision "Turret Head," equipped with three 9" quick-change slitter heads. Turret slitters can change heads in one minute. Power unloading Scrap Winders, one on each side of the line, dispose of scrap edge trim. Scrap bundles are unloaded, hands-off, directly into scrap containers. A hydraulic Carryover Table, directing the strips from the Turret Slitter to the Tension Stand, bridges the deep looping pit. From the Tensioner, the strips are fed over an Exit Pass Line Roll to a hydraulic Feed Table and an Exit Unit mounted Overarm Separator. The Exit Unit, Feed Table and Overarm are designed to take advantage of the natural coil set and funnels the strips down to the Recoiler, where the strips are clamped by a 3" diameter gripper. A 250 HP-DC motor driving through a 2 ratio parallel shaft helical gear reducer provides power to rewind tight straight side wall coils. Coils are unloaded via Coil Car, and placed onto a 4-Arm Exit Turnstile. An "operatorless" Programmable Downender retrieves slit coils from the Exit Turnstile and deposits the coils onto the Packaging Line conveyor. The Downender automatically removes coils one at a time from the Turnstile arm, based upon a list of coils programmed into the downender controller. After downlaying, the coils are conveyed to a semi-automatic Coiltech/Signode Strapping Machine, where 3/4" radial strapping is applied. After strapping, the operator places coil spacer blocks onto the coils and sends them off to the Automatic Coil Stacker. The "Turret Stacker," equipped with two ID-OD coil grab stacking heads, picks up a coil with one head while the second head is simultaneously stacking a coil. This simultaneous activity allows the Turret Stacker to handle coils as fast as they can be strapped. Orders are sorted on a 6-Station Turntable. 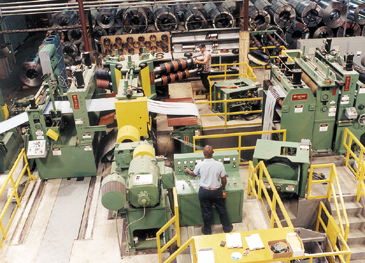 The palletized slit coil packages are discharged from the Turntable onto a scale station, where they are banded, weighed and tagged. Ready-to-ship packages are finally discharged onto a storage conveyor.